I love sharing these experiences with you as they help you see that yes, I am just like you, and also that there are ways to move through these challenges in a love-filled, empowering and peaceful way. It is ok if you get knocked down sometimes, what matters is if, and also how, you get back up again. Some of you may already know that towards the end of last year a significant and long-term relationship in my life came to an end. I shared bits and pieces of this experience in my work, but overall it was a very deep and private experience. This break up was one of those huge, life altering moments for me. I was floored. Broken. Devastated. For months I waded through emotions of grief, pain, hurt, anger, abandonment and total resistance. Since that time, I have done an incredible amount of healing within myself to let go of this relationship, mend my broken heart and begin to welcome in the new. I have cried endlessly, prayed, meditated, worked through Kinesiology sessions, cried some more, retreated, processed and fully embraced the pain. I made a deep commitment to really show up for this healing process. To get the soul learning’s, to grow as a person, to feel it all no matter how uncomfortable it was, and to face up to the deepest, darkest parts of myself. And then, a few months ago something shifted. I suddenly and unexpectedly found myself in a new relationship. It literally just landed in my lap. All of my work in releasing the old, letting go and creating space allowed for something new to rush in effortlessly. It has been a challenge to open up my heart again, to be vulnerable, to let someone back in to my world. It has been scary and at times hard, but it has also been freaking beautiful. I am so grateful to be where I am now and for everything I went through with my ex, as I have transformed as a woman, and I feel I am showing up in this new relationship in a completely different way. And now I can also show up and authentically share with you, how to do the same. I have been hearing a lot of similar break up stories lately. Clients are sharing with me in their sessions, friends are confiding in me and readers are emailing me, all sharing stories of significant relationships ending. This is big stuff. Huge. It can be really really tough. But clearly something is going on. We are being called to release what is not truly right for us. We can cling, fight and resist all we want, but if it is not meant to be, then there is nothing you can do to change that. You might as well just surrender and flow with it. Many of us are still clinging. Still holding on. Still too scared to fully let go and open up to something new. Whatever is unfolding right now is happening for a reason. It is meant to be. You can either fight, struggle and resist, or you can just trust the process and go with it. I felt inspired to share with you what has supported me to heal. To let go. To move on. I hope that my experiences will serve as a guiding light for any of you struggling with this process. You’ve got to stop fighting with what-is. If your relationship is falling away, if things are crumbling, if your ex is moving on, you have to completely accept it. Agree with life. Trust the process. Embrace this moment. Whatever is happening right now, accept it wholly and completely. You may not like it and it may be painful. You may be seeing things unfolding that you want to stop, but I am going to encourage you to instead surrender completely. Surrender to what is unfolding right now. Let it be. Accept that this is exactly what is meant to be happening. This is right. Let go of your way and flow with the divine way. You do not need to understand it, and you definitely don’t have to like it, you simply just have to accept it. Don’t try to avoid the pain. Don’t distract yourself. Don’t brush over it. Get deep in to your sadness, your grief and your anger and feel it fully. Own it. If you try to run from it, it will chase you your entire life and every new relationship you call in will be tainted by the past. In past break ups, my coping mechanism has been to get drunk, party hard and distract myself with casual flings, but all I ended up doing was suppressing my pain. Don’t rush your process. Feel it all. If you need to spend days curled in bed wailing and eating chocolate, then do it. Don’t judge yourself. You need to honour your feelings, dive deep in to the pain and fully grieve when something significant in your life ends. Your world may feel chaotic and unstable so support yourself to find your centre and balance within you, despite the change unfolding around you. Everyone in your life (especially your significant other) is your teacher. There is a divine sacred contract between the two of you that is unfolding right now. They are playing a role for you and it is up to you to show up for the assignment. Get out of victim mode and open your mind to the possibility that there is a beautiful opportunity in here for you to learn and grow. Start to see beyond the physical facade and instead see yourself as 2 beautiful souls who agreed to dance together before you entered this lifetime. In the months after my break up, I decided to work on cutting the energetic ties with my ex by working on a soul level. I would close my eyes and begin to imagine us as two souls sitting opposite each other. I would feel my soul, and see his soul in front of me, and I would speak to him on a soul to soul level. I asked questions like “What do I need to learn here?” and “Why is this happening?” and “What are you here to teach me?” And I would imagine lovingly letting him go, releasing his soul, closing off our contract and cutting the energetic ties. When my relationship ended I was able to see so much about myself that I had been unconscious to. If you stay caught up in drama, blame and victimhood you will miss the precious learnings that lay here for you. Bring your attention back to you and show up for your work. What do you need to learn about yourself from this experience? Where have you began to make that person the source of your love, comfort and security, rather than being the source of that for yourself? Where have you been allowing yourself to be treated in a way that is less than you deserve, or where have you settled for less than what you truly want? How has your ego been playing out through the patterns of need, control, manipulation and fear and how can you heal and release this? Roll up your sleeves, and get to work. You may be in pain, you may be hurt and someone may have done you wrong. But if you are walking around with resentment in your heart, the only person you are hurting is yourself. You will want to close your heart to avoid feeling the pain, but I am going to encourage you to open it, especially in those moments when you want to shut down. For your own sake, you need to begin to practice forgiveness. No matter what they have done. No matter how much they hurt you. No matter whether you think they deserve it or not. When you notice your mind attacking this person I want you to stop, close your eyes, put your hands on your heart and send that person love and light. Wish them happiness. With them everything you wish for yourself. Pray for them. Let them off the hook. Allow them to be who they are. Forgive them, release them and move on. This is where our work lies. Not in needing someone else to complete us. Not in looking for love outside of ourselves. But becoming this for ourselves. Being the love of our life. Treating ourselves the way we would love that person to treat us. I know self love is big work, but it is an incredible process to commit to. The best place to start this journey is with self acceptance. This involves allowing ourselves to just be who we are, as we are. Once you completely accept and embrace yourself, you will begin to clear the blocks to the love within you. Stop clinging to the past because it is safe, comfortable and familiar. Let it go. Yes, it is going to be scary. You are going to feel vulnerable. And it is going to be filled with uncertainty. But when the inner pull starts to come, and it beckons at you to get out in to the world again, you have got to follow it. The first date I went on after my ex, was far from romantic. In fact it was totally traumatic. I came home and cried uncontrollably for an hour while demolishing an entire large bag of Dorrito’s corn chips. Sigh. Needless to say, it was a tough night. But I picked myself up again and kept going. I kept holding the vision of the new relationship I wanted and kept opening myself up to it. And here I am now, in a beautiful new relationship, revelling in the experience and embracing the unknown. It is pretty freaking special. There is light at the end of the tunnel my loves. I know it feels like you will never get there. I know it feels like you will never love again and like you will never find anyone like the one you are leaving behind. But I promise you that you will. If you are meant to be together you will. And if you are not you won’t. All you can do is trust whole-heartedly that you are exactly where you need to be. You must let the old fall away and show up bravely to call in the new. 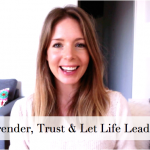 Are you experiencing change, transition and letting go in your relationships right now? Share your experiences with me below and let me know what you will take on board from this post to support you. Whoa what a powerful post. Thank you so much for sharing this with us Connie. I’m not sure if it is the age or stage of life but I have seen a bunch of solid relationships fall apart lately (including my own) and it is so tough to deal with. I love how you are all about connecting with yourself and letting go and forgiveness. So far I have found it easier to be angry and hurt even though I can acknowledge the part I played in things not working it is easier to feel hurt and sad sometimes. This is absolutely a transitional point in my life and has changed my trajectory, but guess what, that is what the universe had planned for me so I am accepting it with open arms! I know one day I will meet someone and will say ‘so this is why none of my past relationships worked, so I could meet this person’ but until then I am working on myself and realising that I don’t need a man to feel loved and complete. This is a truly beautiful and also wise and practical post Connie. Thank you. I only wish it had been around many years ago when I went through a heart shattering break up. The big lesson I needed to learn was to allow the pain and uncomfortable feelings to surface but because they felt so ‘bad’ I never let that happen. What a mistake! I needed to trust more that things would get better and I would be ok – which of course I was – but for seemingly a long time. This should be recommended reading for just about everyone! omg so timely and perfect for me! Thank you Connie!! What a lovely post. I am happily in a relationship now but in the past have fought against the pain and the change that happens when a relathionship isn’t right and this has caused me even more angst. I recognise now that I was only truely open to finding someone when I actually looked after and loved myself enough. If I ever have to go through this again I know that I will have to truely feel the pain and accept it in order to heal, it’s scary thought but it is the only way you are right. Thank you for this post, Connie. I’m going through this at the moment and there are a lot of ups and downs. Somedays I feel all ok and I can even send love to the other person and the next I’m crying all day or full of anger and hatred. Thank you Connie – I have been waiting for this one! A very important message to share. It really helps break down the fear in holding on to things that are no longer serving us. Thanks for instilling in me courage, strength and hope. This was really helpful Connie. I still want your advice on something. I think my main problem right now is that I believe I won’t find someone I can love or even like as I loved my ex.. I think if I got over this idea I will be happy and fearless and stop regretting my losses. I know my belief/feeling can’t be true, at least people claim it is not true! But I want to really believe it is not and I don’t know how to do that. This is really powerful stuff, Connie. I was spending time with my best friend this weekend and she had just come out of a relationship that was emotionally abusive. It left her completely confused and overwhelmed. She confided to me she can’t trust and feels scared. I showed her this post. I loved the part where you said you imagined both your souls and visualized letting him go with love so you can cut the energetic ties. My friend is going to try this. I am in a confused state in my personal life and without going into detail, I have started visualizing being in a happy relationship and marriage so I can manifest the right relationship. Thank you for this post. I am going through a very tough heartbreak right now as I found that my “ex” is now dating an associate of mine. I knew he would move on eventually but it stings to know it’s with someone I know and will see again because of work. Looking forward to the day where this is all a fading memory. I’m open to new love but not quite ready for it at the moment. I feel I need to heal before I embrace someone else. Wishing I had a time machine at the moment. Thanks Connie. I’m so hurt and so broken right now and I know I gotta get up for me and I think the hardest part is forgiving the hurt and teh selfishness of not being appreciate after everything you’ve invested and did for them and teh sad part at the end of it all your the bad person. Thank you so much for writing this. I desperately needed to read #1 and #7….most desperately. I cannot wait to begin trusting the process, which will happen as soon as I log off my computer. I’ve been reading your posts little by little. It’s become my daily mantra to follow you. I’m not sure if you will ever read this message but maybe is good practice to release my feelings and story to the online universe out there. I was in a 3 1/2 year relationship with what I consider the “Love of my Life.” Last fall, he decided to move up North to be closer to his kids, since he was separated from them for approx 2 years. I was supposed to move up North with him, but I stayed behind until I found a job up in his area. It turns out that I did find a job but it was further South and away from him. At the beginning, I didn’t understand how the plan that I wanted so bad didn’t happen. Well, nine months later now I understand. It turns out that he went back to his ex-wife after 3 1/2 years of being divorce from her, he stated ” family pressure and his kids.” Now I’m left in a new city, no friends, no support system, picking up the pieces of a broken heart. I’ve gone through all the steps of grieving. I’m currently between the acceptance and letting go step. The letting go step is probably the hardest one of all, so I keep reading and re-reading your blog, to remind myself that their is light at the end of the tunnel. I keep imagining my heart being a broken tea cup, and now i’m in the process of gluing it together. In the Japanese culture a broken tea cup that was put together piece by piece, is priceless. It reminds them of the history, the age, the knowledge, the experiences the tea cup has been through. So, my heart is a broken Japanese tea cup that I’m in the process of gluing together. I know I’ll be stronger after this experience but for sure your posts plus your podcasts, have become an excellent support system.